The Trans-Pacific Partnership was just the start. With the successful negotiation of the TPP trade deal, now awaiting ratification from participating countries, global attention is shifting towards China’s ambitious One Belt, One Road project (Obor). So what is Obor? And is it likely to be a success? Obor is essentially the vision of a new consumer-producer network in Eurasia, creating an integrated trading bloc in the East and rolling back the existing global model, where the East produces and the West consumes. The story began on 7 September 2013, when China’s President, Xi Jinping, gave a speech at Kazakhstan’s Nazarbayev University. Here, he articulated what seemed a simple vision to integrate and better connect Eurasian markets, with China at the hub. “We can innovate the mode of cooperation and jointly build the Silk Road Economic Belt step by step to gradually form overall regional cooperation,” he said. But its simplicity is questionable. When read today, the matter-of-fact reporting from 2013 questions few of the consequences from this ambitious plan to build a modern version of the ancient pathways described by Sima Qian. 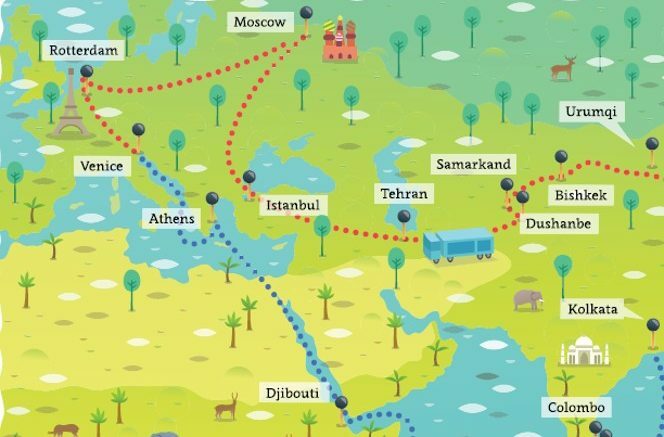 For two millennia, what is today known as the Silk Road – a complex patchwork of overland and maritime routes connecting China and southeast Asia with India, Africa, Rome and later western Europe – enabled the exchange of silk, spice, textiles, knowledge and religion. The centres of exchange – inland cities and coastal towns such as Goa or Constantinople (now Istanbul) – became vibrant hubs of commercial and cultural activity. When put into a historical context, President Xi’s ambitions take on a much grander scale. How exactly does Obor diff er from the TPP? What role will China’s new Asia Infrastructure Investment Bank (AIIB) play in this growing geopolitical tug-of-war over trade? And, finally, what does it all mean for executives who have a business to run? The answers are relatively simple. Increased connectivity on the scale proposed by China will bring substantially increased complexity to any business operating within this proposed network. Parag Khanna, global strategist, leading author, and senior research fellow in the Centre on Asia and Globalization at the Lee Kuan Yew School of Public Policy at the National University of Singapore. Obor is all about the effort towards deeper Eurasian infrastructural connectivity from Shanghai to Lisbon. What China wants is more connectivity… All infrastructure projects in Eurasia serve the purpose of connectivity. To put China’s connectivity ambitions into financial terms, the China Development Bank has committed to investing $890bn in infrastructure projects attached to Obor, the Public Broadcasting Service (PBS) reports. It highlights that the new Asian Infrastructure Bank (AIIB) has an additional $100bn available for infrastructure investment. These dollars are being used to build connectivity between China and the rest of Eurasia. By comparison, PBS points out, the Marshall Plan amounted to approximately $130bn after adjusting for inflation. What is so important about infrastructure and connectivity? Infrastructure is a global public good. There are three mega-public goods out there: security, environment, and connectivity. China has put itself forward as the leading provider of the global public good of infrastructure and connectivity. It is doing so through physical infrastructure projects, such as Huawei’s telecom networks, and all of these things enhance a country’s connectivity. China’s vice premier, Zhang Gaoli, has urged neighbouring countries to consolidate the social foundation for connectivity. This comes as little surprise. All connectivity built in Asia serves China, even if it is built by China’s rivals such as Japan or the US. But what is China’s expected return on its own massive investments? First, and assuming China can deliver on such an ambitious vision, Obor has the potential to help put the nation’s production overcapacity to use. Connecting with more consumers can help increase demand. Another benefit could be increased soft power – as China puts its massive foreign reserves to work. Anyone who wants to benefit from the increased connectivity brought by Obor will need to learn about many new customers and markets. This process begins with understanding where these customers are, geographically. These are new geographies that represent a significant shift away from today’s dominant Organisation for Economic Cooperation and Development (OECD) economies. Approximately 1.5 billion new workers in Asia and other emerging economies joined the global workforce over the past three-to-four decades. This created a relatively simple world where many companies outsourced production to the East and then shipped their products to consumers in the West. The latest figure shows consumption in OECD economies has dropped from 84% to about 70%; by mid-century, about half of global consumption will be outside of OECD countries. The rise of 3.5 billion new middle-class consumers in the developing economies of India, China, Asean, East Africa, Middle East and Latin America is driving this consumption. How does Obor connect China to non-OECD growth and consumption? As we head toward the middle of the 21st century, we will see that about half the world’s consumption will be in developing countries. And, looking further, they’re primarily in the countries linked up by the maritime Silk Road. So the maritime Silk Road is the key to the new consumption and the new markets in the world over the next 25 to 30 years. Th e overland Silk Road Economic Belt will account for approximately one-quarter of Obor’s economic contributions, with the Maritime Silk Road accounting for as much as 75%. What initiatives do you see coming in during the first few years? China’s first initiative will obviously be putting in good infrastructure, because without good infrastructure it is hard to trade. So we will see things like the activities of the Asian Infrastructure Investment Bank (AIIB) that would actually put in the roads, the railways, the airports, the ports and so on. But as soon as that is in, or even before, we are going to be starting to talk about trade deals – bilateral deals, multilateral deals and regional arrangements – and that will facilitate trade. 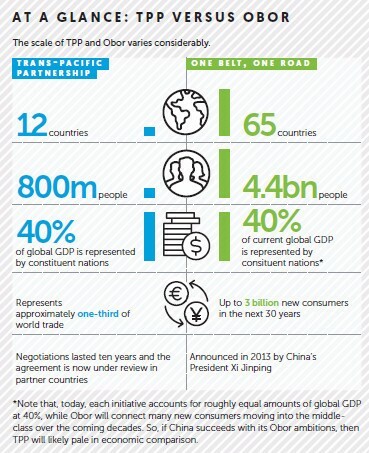 Trade compared to connections Given that questions about Obor are asked while TPP is being ratified by participating countries, it is perhaps inevitable that we ask how Obor compares to TPP. In the simplest of terms, trade deals like TPP will become an important part of Obor. These agreements lower barriers and open up the flow of goods and services between partner countries. These flows will only increase as infrastructure projects related to Obor are completed. Are we seeing only dollar signs? The initial pool of $1tn or more will not lower the bar for funding infrastructure projects. Pragmatism and hard negotiations will rule the day, and the banks will continue to perform due diligence. Obor does not improve the odds that mediocre or risky infrastructure projects will be funded. National interests or China’s interests? Nationalism has been on the rise across Eurasia for quite some time. How will economic and political leaders in any market balance this increased nationalism with Obor funding that, in effect, makes those leaders at least partially subservient? As Parag Khanna has pointed out, these investments serve China and are being funded for China’s benefit. Additionally, what will neighbours, such as Russia, think of China’s increased influence across the region? We know many countries are angry about China’s hardball tactics to claim most of the South China– Western Philippine Sea. The potential for pushback is significant. Does stability necessarily follow from investment? Many of the markets to be connected by Obor are quite volatile. Can we honestly assume that a bit of prosperity will usher in peace? Obor and some of the volatile markets it wishes to connect may well put to the test this assumption about peace following prosperity. Will good governance magically appear? In addition to questions about stability, corruption is an equally significant concern. Will parties accustomed to receiving money unofficially suddenly adopt transparency and full accountability simply because China wishes to invest in a power plant, telecommunication network, or railway? Such an assumption might seem optimistic. So while a great story, there are reasons to think that the reality for Obor will likely differ from the ambition. Parag Khanna asserts that, “connectivity is destiny”. This is a play on the old adage that geography is destiny. Khanna says in his new book Connectography that the winners in the 21st century will be those who succeed at building connections through infrastructure and leveraging those relationships for long-term gain. Connectivity, however, is not a silver bullet. With connectivity will come increased complexity for business. Multiply that statement by 65 countries, 4.4 billion people, emerging technologies, new business models, large numbers of small- and mediumsized enterprises (SMEs), and extremely diverse peoples. If Obor materializes, we will see a business world far more complex than today’s ‘build in the East and consume in the West’ model. Finally, and on the geopolitical stage, we cannot assume that large Western markets will simply do nothing. If Khanna is right about all the infrastructure ultimately serving China’s interests, it seems plausible that the West might reconsider its current approach. The US invests its resources into the mega-good of global security and often acts as the world’s police force. Meanwhile, China appears to look at that decision and, in effect, say “thank you for creating a safe world”. Into this relatively safe world, China then invests its reserves into infrastructure projects that serve the long-term interests of its government and people. Sooner or later the West may wise up. So while it is too early to predict whether Obor will achieve its grand aims, the narrative is inviting. But with greater connections will come a world that, for business executives, is likely to be a great deal more complex than today’s. There will inevitably be a need to improve our understanding of complexity and how to run a business in a deeply connected region. Additionally, business executives will need to learn how to leverage networks more effectively, work across many diverse cultures, and contribute to the pursuit of mega-goods while also delivering economic results. Perhaps the challenge to executives will ultimately prove just as ambitious as Obor’s aims.